It's Thursday, and your restaurant has 150 people in the book for Saturday night. The meat guy pulls up out back as the produce and beer trucks drive away. Kitchen and waitstaffs are scheduled. Then Friday morning, the weather calls for a storm. It doesn't matter if they're saying "possibly affecting the Poconos," the cancellations pour in. Such is the life of a restaurateur. But not the lot of a caterer, who operates with fewer variables. Head counts: firm. Menu: fixed. Staffing: set. Come hell or (reasonably) high water, each catering event is in the bag - bought and paid for. This is one reason that many restaurateurs - including big guns like Stephen Starr and Jose Garces - have added catering to their repertoire, hiring battalions of chefs, cooks, and sales people. Nationally, restaurant sales are more or less flat, according to the National Restaurant Association. "It's an alternate revenue stream," said Steve Cook, a partner in Zahav, Federal Donuts, Percy Street, and Citron & Rose, a kosher restaurant that started catering six months ago. The payoff can be handsome. Caterers aim for a 40 percent gross profit before overhead is factored in, considerably higher than even a busy restaurant. Also, catering "allows us to keep our brand top of mind," said Simon Powles, who heads Starr's catering division, which operates primarily in Philadelphia and New York City. The move also has shifted the landscape. Restaurateurs compete with traditional caterers - from smaller outfits to multinationals such as Aramark, Sodexho, and Compass - for rights to operate in certain venues. Also in the mix are on-premises caterers, such as Joe Volpe, who has built an empire of venues in the city: Cescaphe Ballroom, Tendenza, the Curtis Center, Vie, and now the Down Town Club. Restaurant operators say they are simply responding to demand by offering catering. Starr fielded many requests to re-create particular restaurant menus - such as Buddakan's dip-sum doughnuts and dumplings - in other venues, even private homes. Brulee Catering, which happened to grow out of the Cuba Libre restaurants, advertises a stable of name chefs, including Jean-Marie Lacroix and Guillermo Pernot. Garces, in the catering game for two years, counts as his main exclusive venues the Kimmel Center, Merriam Theater, and Academy of Music. Starr, whose catering division began five years ago in the back of one of his restaurants, has the Art Museum; three Hub conference centers; two Philadelphia law firms; Grounds for Sculpture in Hamilton, N.J.; the Rubin Museum of Art in New York; the New-York Historical Society; and the New York Botanical Gardens in New York. Brulee is one of the biggest local players. Barry Gutin and Larry Cohen started catering in 2004 in an arrangement with Max & Me and have assembled a collection of venues including the National Constitution Center, Please Touch Museum, Independence Visitors Center, Legacy Youth Tennis and Education, Masonic Temple, Strawberry Mansion, Independence Seaport Museum, and the Cruiser Olympia. Three years ago, Brulee acquired Culinary Concepts and developed an off-premises catering kitchen in South Philadelphia. Brulee does 3,000 events a year, Gutin said. Starr recently opened Starr Events, a catering kitchen and sales office, on North Broad Street. 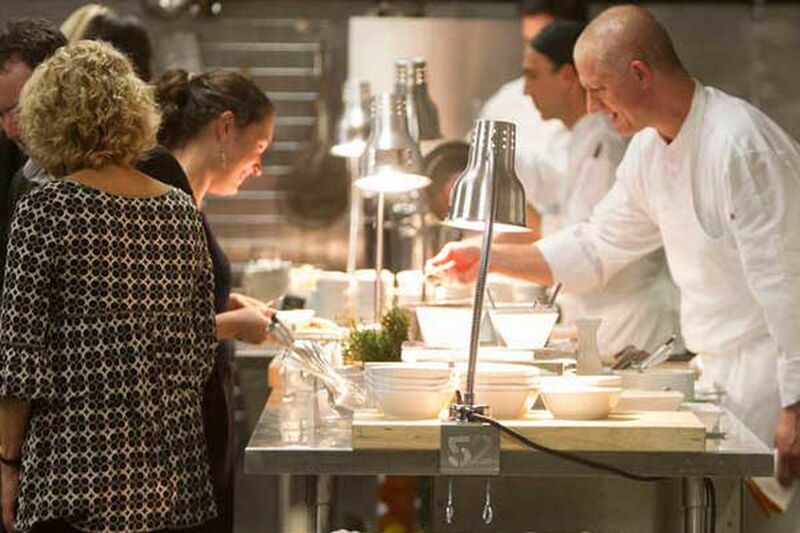 At a recent opening party, Starr chefs - many of whom have worked at his restaurants - opened the kitchen to feed a crowd of movers and shakers. The business was much different 40 years ago, said Steve Poses. He opened Frog restaurant in Center City. Within a year, he said, Frog leaped timidly into catering when a group of regulars - architects - was planning the 1976 AIA convention. "They asked us to do it and we said sure, sounds like fun," Poses said. Out of its small kitchen on 16th Street near Locust, on a six-burner range, Frog fed crepes to 1,200 people. "It was a naive and simpler time in many respects," Poses said. "Today, probably a meeting planner would be involved in such an event. Crepes would not cut it. Food tastes and guest expectations have evolved and are today vastly more sophisticated for both restaurateurs and caterers." Poses, who has had the catering business at the Franklin Institute for 30 years, opened a formal catering kitchen in 1994 and gradually left the conventional restaurant business. "In the end, catering provided a more stable business - one that rewards you for experience and longevity, whereas higher-end restaurants tend to be rewarded for being new - something that, by definition, cannot be sustained," Poses said. Mitch Prensky, a New York chef, moved to Philadelphia a decade ago, thinking he would open a restaurant. He was asked to cater a dinner party, which led to the creation of Global Dish, his catering company. Five years ago, he and his wife, Jennifer, opened the restaurant Supper on South Street. He said he treats catering jobs as "little restaurants that open in people's homes." He likes to compare the restaurant business and catering business to "a zebra and a horse. They may look similar, but they're not the same thing." Contact Michael Klein at mklein@philly.com.